Rinse the lentils and cook them with a bay leaf, which will also make them more digestible and the purpose of cosmetics; add salt only when cooked, so they will stay softer and even then more digestible. If you use the small lentils do not need 20-30 minute soak and cook in about. While the lentils are cooking, boil the water for the pasta and prepare the sofrito for lentils with chopped shallot and carrot. When lentils are cooked, drain, remove the bay leaf and add them to the pan, add the tomato sauce, a pinch of red pepper and season with salt. 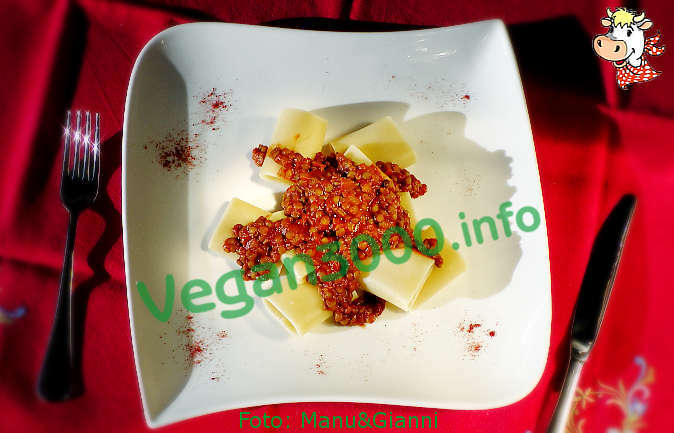 Reduce the tomato puree and when the pasta is cooked al dente, drain and serve with the sauce.